This is one of those "Wow!" gifts for fall that will no doubt make them feel very, very special. It is such a beautiful gift basket that includes many wonderful touches and an abundant selection of irresistibly delicious sweets and snacks. It has something for every palate and offers loads of charm. Even the hand-painted, wooden basket, with fall enhancements is a showpiece in and of itself. They will be able to treasure for years to come as part of their fall décor! 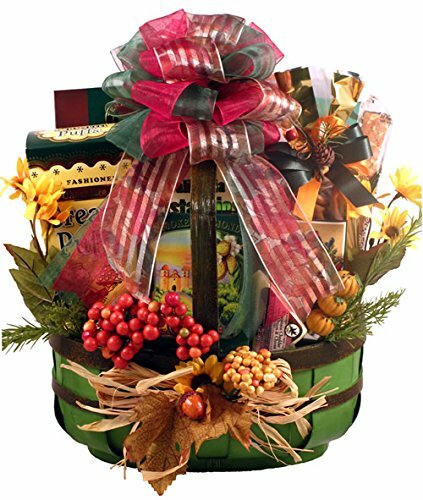 This gift basket is available in three sizes and in two colors. These stunning baskets arrive filled with the following special treats: Smoked Almonds, California Pistachios, Napa Valley Honey Mustard Pretzels, Wisconsin Cheddar With Onion and Chives, Wisconsin Chipotle Cheddar Cheese, All Beef Summer Sausage, Ceramic and Stainless Steel Harvest Cheese Spreader, Three Pepper Blend Crackers, Chocolate Cream Puff Cookies, Chocolate Salted Caramel Cookies, Sugar Cookies, Hazelnut Biscotti, "Harvest of Plenty" Nutty Gourmet Snack Mix, Caramelized Belgian Cookies, Farmers Popcorn Cob (Pops off of the cob), Gourmet Peanut Brittle, Chocolate Caramel Gopher Turtles, Chocolate Covered Cherries, Bruschetta Parmesan Crisps, Apple Cinnamon Cookies, Large White Chocolate Pecan Caramel Gopher, Delicious Mix of Sweetened Dried Fruit and Assorted Nuts, Almond Cranberry Harvest Mix, English Toffee Caramels, Artisan Baked Chocolate Wafer Cookies, Corn Nuts, Chocolate Toffee Almonds. Festive and delicious! This Fall gift basket holds nothing back. We loaded this one with some of the best flavors of fall and arranged them all in this basket for maximum presentation effect!